A couple of weeks ago in Parashat Noach, our classical commentators wrestled with the statement that “Noah was righteous in his generation.” Rashi clarifies that had Noah lived in the generation of Abraham, he would not be considered righteous. We then must compare Noah’s actions to those of Abraham’s in this week’s parasha, Vayera. Noah was commanded to build an ark to save himself and his family as God wiped out all of humanity. Noah did as he was commanded. He only looked out for himself and didn’t argue with God to save anyone else. Abraham on the other hand, confronts God directly in this week’s Torah portion. God declares that, “The outrage of Sodom and Gomorrah is so great, and their sin so grave!” (Gen. 18:20). Abraham, unlike Noah, refuses to stand idly by. Abraham challenges God. “Will you sweep away the innocent along with the guilty?” (Gen. 18:23) Abraham asks. He then begins to negotiate with the Holy One, determining the number of righteous individuals that must be found in these cities in order to save them from God’s biblical wrath. The message isn’t that they were ultimately destroyed. The message isn’t even that the righteousness of a few outweigh the sins of the many. The message is that we must not stand idly by. What happened in Sodom and Gemorrah did not directly affect Abraham, but he stood up – even to God – to protect those whom he believed was in harm’s way. God expects us to stand in the breach. God demands us to stand up for the rights of all. 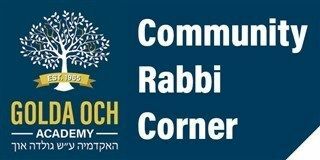 As a parent of a Golda Och Academy student – and a proud alum – I appreciate that this school teaches our children to act as Abraham acted. To be a Jew means to stand up for others and to help those who are most vulnerable. And to have faith in God may even mean to challenge God at times. GOA teaches our children to stand in the breach. May we be an example for our children and do the same. Even when it is not popular, even when others may say otherwise, let us stand in the breach for those who are vulnerable, walking in the ways of our biblical ancestors. That is what God demands of us, and that is what our parasha teaches us. Shabbat Shalom!